picturingpositive | Making the most of every new day! Romeo enjoys the freshly cut grass too! As an introvert, I cherish my solitude. I dearly love my children and husband, but in order to be the best person for them, sometimes I need to spend a little time just for me. To me, solitude need not be found on a quiet mountaintop or in a beach chair listening to the sounds of the ocean. I wouldn’t pass up those opportunities, but I can enjoy the solitude I find just listening to the steady drone of the lawn mower as I mow my lawn. I can turn off my busy mind for a little while and just enjoy the smell of the freshly cut grass and the breeze on my face as I walk back and forth across the lawn. I can slow down and allow myself to notice the new flowers blooming in my yard, the bunnies in the neighboring yard playfully hopping after one another and the freshly formed buds on my lilac bushes. When I have taken time to enjoy my time alone and recharge my battery, I am ready to once again enjoy the noisier fun family activities to follow! 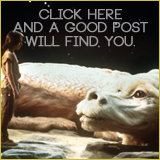 You may wonder WHO the header of this post refers to. Well, gentle reader, that would be ME. After stepping on the scale a few weeks back, I have determined that I am going to get back to a better version of me. I’m over 40 now and my metabolism has dropped to seemingly nothing. I’m on medications that can cause puffiness and weight gain. I do my elliptical or treadmill at least 3-4 days each week, so the extra weight is “muscle“. My wonderful hubby presented me with an early birthday gift, a FitBit Charge HR. Don’t worry; he knew I had researched the various devices and really wanted to get the FitBit. He is awesome and says he loves me no matter what, so it was not a push to get me to look better. ❤ I want to do it for me so that I can be healthier, be around longer for my family and wear adorable outfits and even skinny jeans again. If it’s gonna be, it’s up to me! 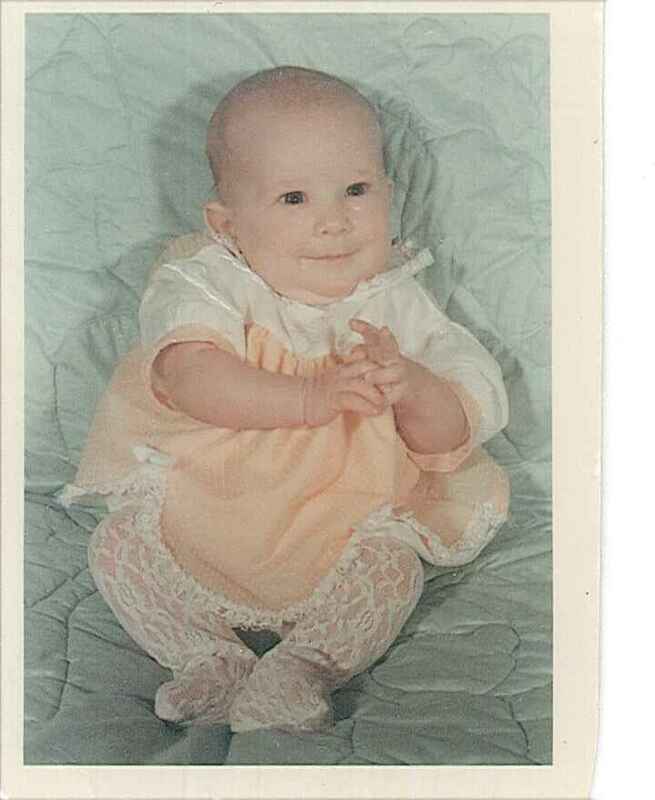 (Words of wisdom from a former Weight Watchers Coach) Wish me luck! 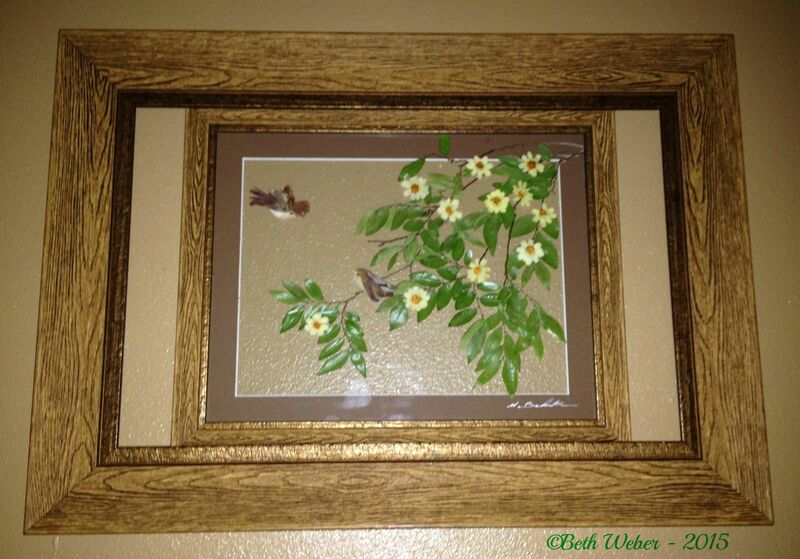 The beautiful photo of the two little birds encased in a frame custom-made by the artist! Such talent! My daughter loved this little kitty. I can’t remember what type of flower or grass the body is made from, but I remember it has rose petal leaves and collar. When I saw this week’s WordPress Weekly Photo Challenge, I first thought of the usual “inspirational” photos, sunrises, sunsets, beautiful nature photos. When I thought a bit more, I remembered something an incredibly talented artist said to my daughter and me as we were purchasing two of her magnificent creations at the recent Spearfish Art in the Park craft festival. Her space at the festival was filled with incredible pictures created with dried plants, leaves and flowers that she had, with incredibly talented hands, made into pictures of animals, simple floral bookmarks and incredibly detailed landscapes. As we were purchasing our items, my daughter asked her how long it took her to make one of the photos. The artist explained that it is a long process of selecting flowers, waiting for them to dry, creating the design and the frame and finally completing it. She said if she actually kept track of the hours she spent, she would have to charge more than most would be willing to pay. She explained to us that in many jobs, the workers are constantly watching the clock and wondering why the hours go by so slowly, while in her job she is so involved into creating and perfecting the designs that hours pass by very quickly. 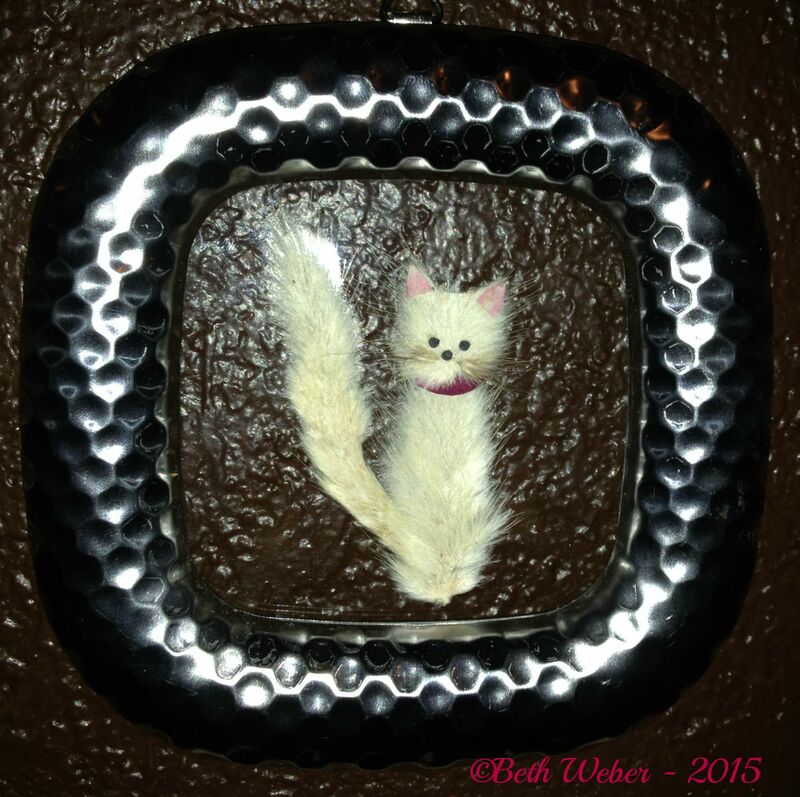 I commented to her that her work is wonderful and that in creating these masterpieces, she shares a little piece of herself with every person who purchases them. If you are lucky enough to see Michelle Barnhart as a vendor at a craft festival, plan to spend a bit of time at her booth admiring the beautiful work she does!! 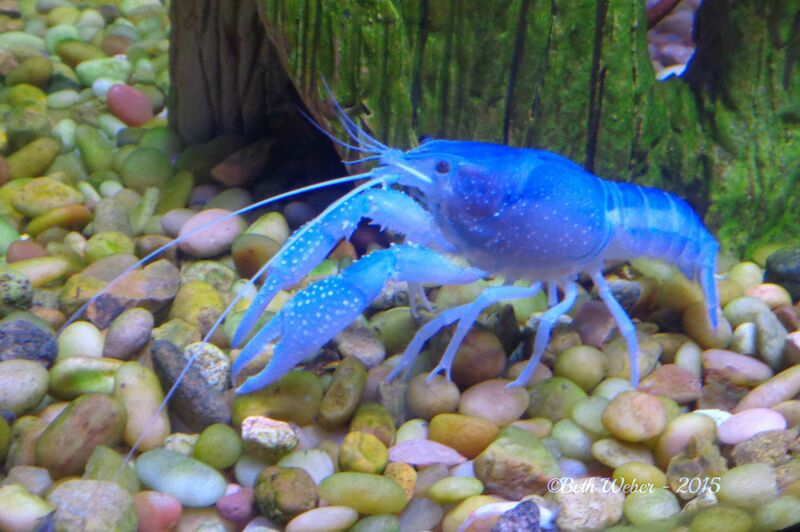 I love the color of this crawfish. Such a beautiful blue! 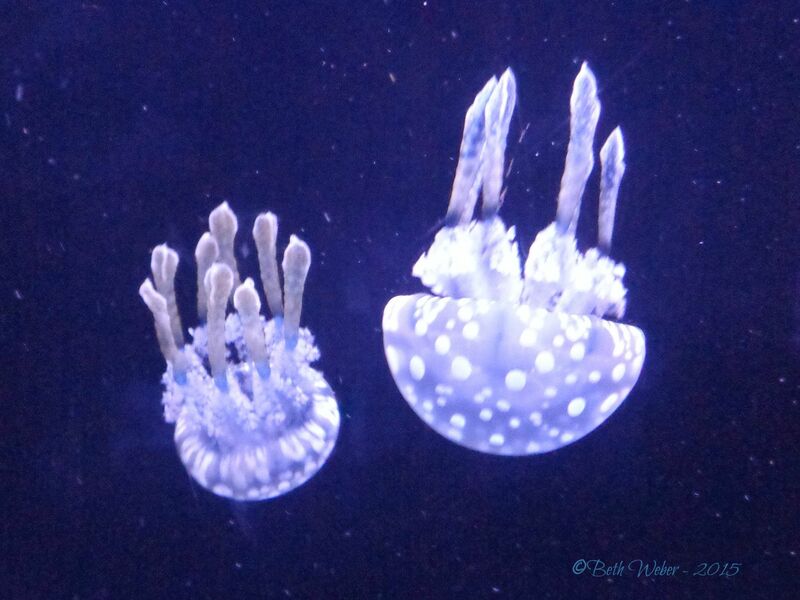 I am always fascinated by jellyfish! 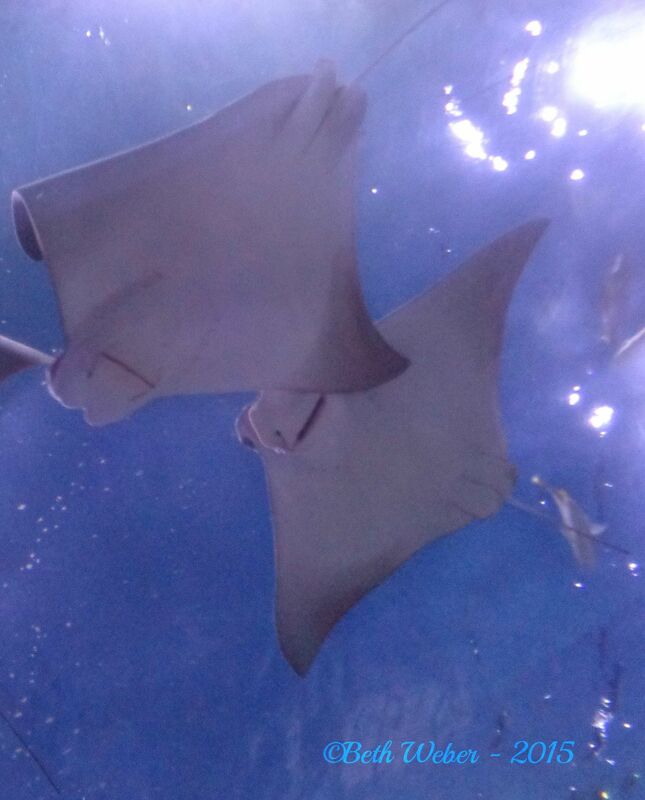 I think stingrays are some of the most beautiful creatures! 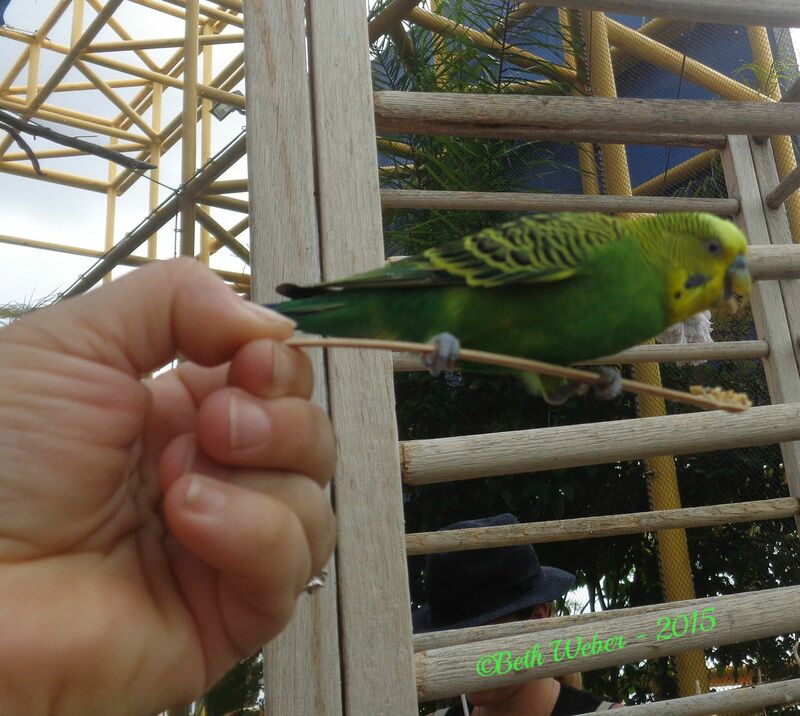 We delighted in being up close and personal with these cute parakeets! I’m sliding in right at the end with an entry for the WordPress Weekly Photo Challenge. This week’s theme is “Up Close”. I’m submitting some photos that I took when our family visited the Audubon Aquarium of the Americas in New Orleans during our family trip in June. I love seeing the details of some of these fascinating animals! 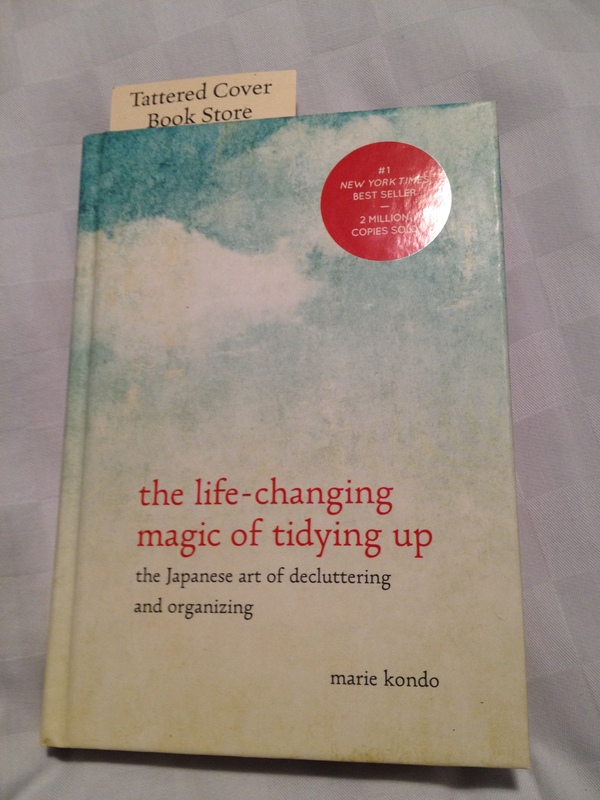 After reading countless reviews praising “the life-changing magic of tidying up, the Japanese art of decluttering and organizing” by Marie Kondo, I found my curiosity aroused to the point where I HAD to read this book. On our recent anniversary trip to Denver, my husband and I visited the Tattered Cover bookstore (AMAZING, by the way), and lo and behold, there was this magical book on the display stand with other books hand-picked by employees at the bookstore. It had a handwritten note underneath saying it was as good as the hype, so I took a leap and bought the book. Four weeks later, I have not yet finished the book, but I HAVE made huge leaps in decluttering. Kondo’s writing style is conversational, and reading this book is like talking with a friend. She gives recommendations in such a pleasant and helpful manner, I found it difficult to argue with her logic. Her advice is to begin with the things that we have the least emotional attachment to and to move on to those with the most. Using that logic, she recommends starting with clothing. Keep only that which brings you joy, Kondo says and I love that advice! In order to do that, she says I must gather EVERY item of clothing that I own, which means cleaning out all my closets and drawers. When I first read that, I admit, I was about ready to dismiss the book outright, but when I thought more about it, it made complete and total sense to me. 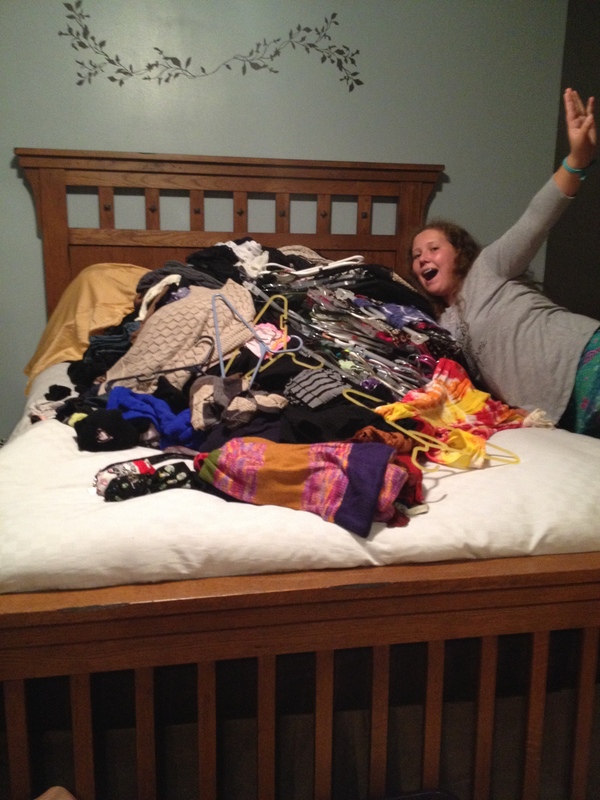 My MASSIVE mountain of clothes! Not QUITE as massive…..making major progress! Scary, right???!!! I did as Kondo suggested and held every piece of clothing and as I did so, thought about whether it brought joy to me. 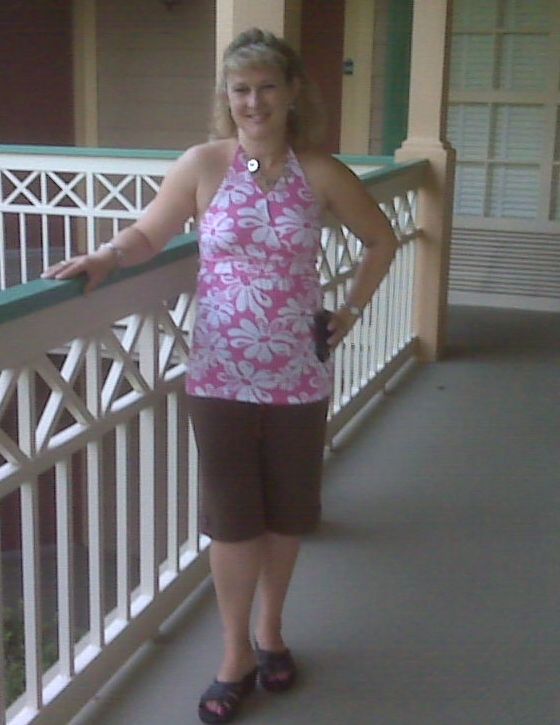 Some items had at one point brought me joy, but hadn’t been worn in years; some I had purchased or had been given to me as gifts, but weren’t my style, didn’t fit comfortably and were inevitibly returned to the closet when I tried them on because they honestly did not make me happy with how I looked. They had made their way in and out of my closet, but had never been discarded because I felt as if I shouldn’t get rid of them since I had spent so much money on them or received them as gifts. She has wonderful words of wisdom about these items. They served their purpose and brought me joy when I bought or received them. In doing this, these items have done their job and can now be released to bring joy to someone else. It’s so much easier to let go of anything by looking at it this way. I turned up my tunes, and with a little help from my daughter, whittled down the massive mountain! I thanked the clothes for bringing joy to me and talked to them as I either hung them gently back in my closet, placed them lovingly in my dresser or folded them and placed them appreciatively in the bags that would go on to others who could use them. Oh my gosh, I DID it! 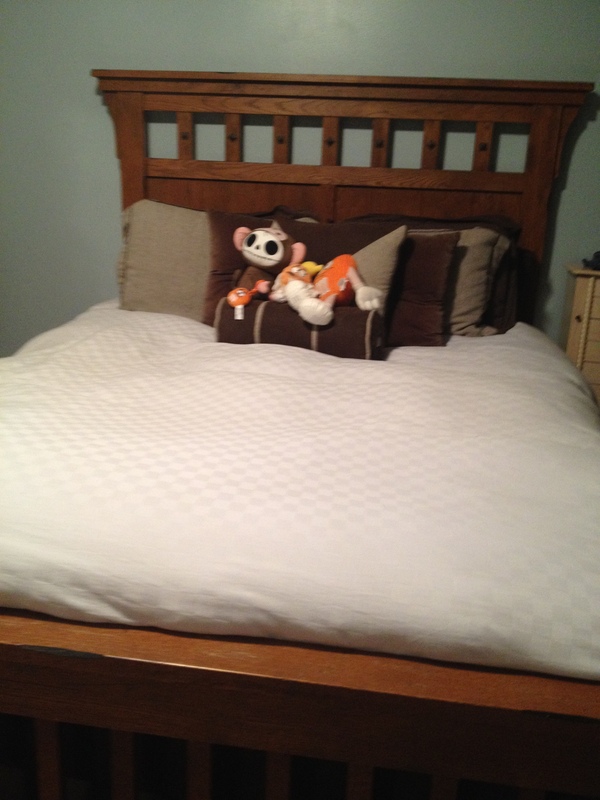 There really WAS a bed underneath all of that! WOW! 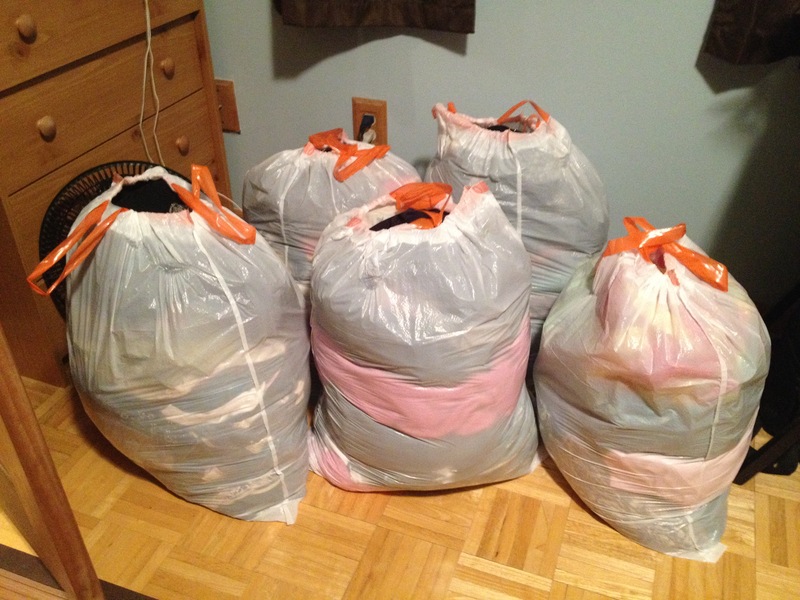 Five bags full of clothing ready to go on to new homes and bring joy to new people! While I can’t say that tidying up changed my life, exactly, I will say that I feel a lot better when I step into my closet now. I really love every item inside and find choosing something to wear in the mornings a much easier task than it previously was! 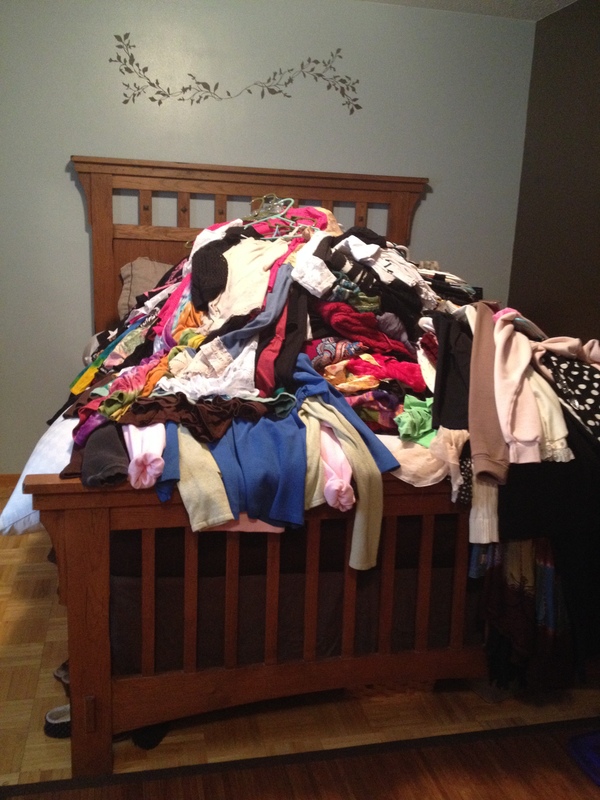 Some of the clothes were shared with my daughter, some with my coworkers, some with my sister and my nieces. 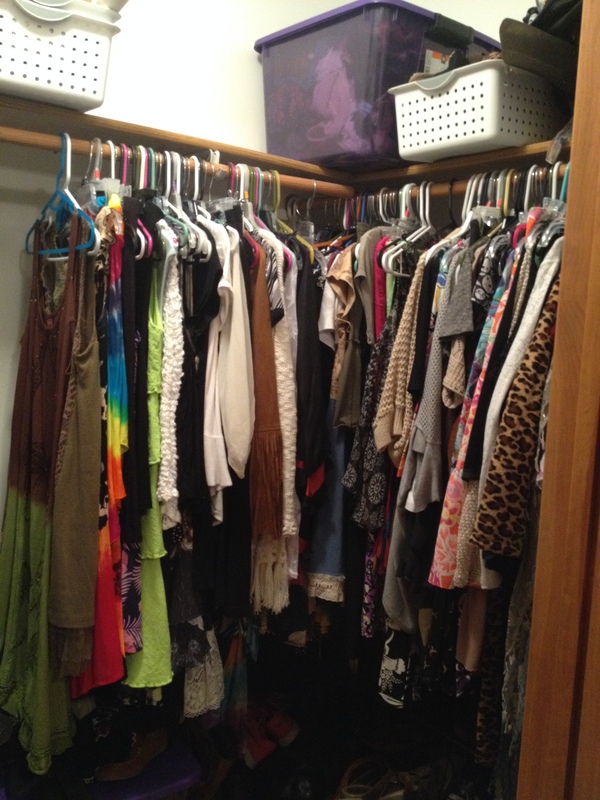 In each case, I really did discover that there truly is joy in giving and knowing that clothing relegated to the back of the dresser or closet will go on to be something new and fun for someone else. If you find that, like me, you sometimes look around your house and think that it’s time to simplify, I think you will love this book! I recommend it highly!